The book can best be described as a collection of short stories, with some longer than others. 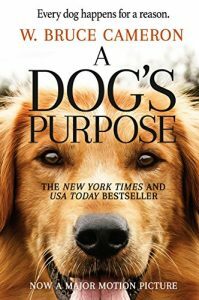 Each story spans the lifetime of one dog, with each story connected by the same dog’s spirit as it passes between lives. Within each story, the dog searches for both its identity and its purpose. And similar to real life, the dog doesn’t settle and relate to its true purpose until it has neared the end of its life. The part of the book that makes it interesting, funny, and disjointed all at once, is that it is told from the dog’s point of view. However, it is an anthropomorphized point of view, meaning Cameron assigns human-like characteristics and emotions to the dog. Anyone who has had or spent a lot of time around a dog can relate to this point of view. It really makes you ponder what might be really going on inside a dog’s head. Instead of doing a full text description of the plot, I’ll let the movie trailer below cover it. I can’t speak to how well the movie represents the book, or how good it was, but the trailer provides a good synopsis. As for the book, it’s a good read for anyone who owns, has owned, or loves dogs. It’s a sweet story, but it can be a bit too sweet in spots, and a touch predictable, at least for me. I’ll admit there were times where I felt as though I was reading the script for a Hallmark movie. With that being said, it is still a book worth reading. I would categorize it as a casual read, meaning I wouldn’t tell you to run out and put it at the top of your reading list. For me, it could be that it lacked some of the characteristics I enjoy in my entertainment reading (which is primarily science fiction or suspense oriented), but then again, it’s not meant to be that kind of book. It’s meant to be a heart-warming story for those who love and/or own dogs. Looking at it from that angle, it served its purpose for me. It certainly made me think back to the purpose that Blake had for our family, and that made for a fitting end and closure to my healing process.